I think my theme song ought to be the old Beach Boys’ number: ‘I get around, round, I get around…’ I do get around. 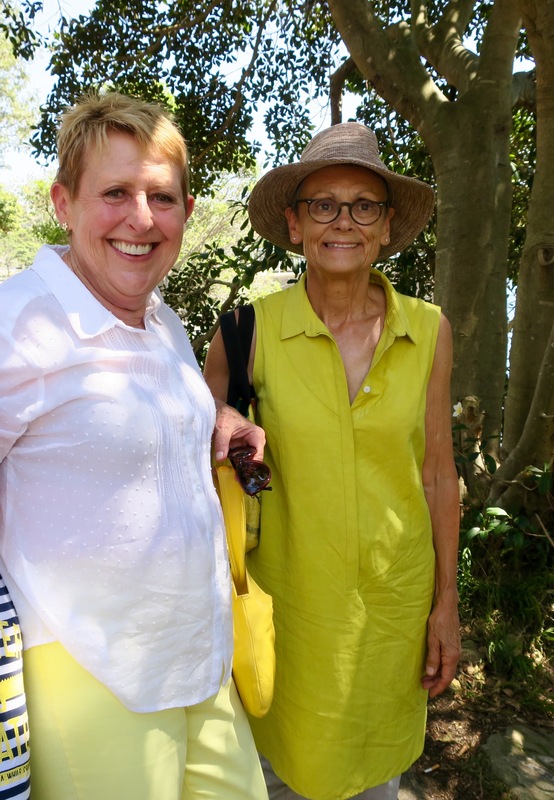 I get around so much I don’t have time to write about all the events I go to, or the visits I make, or all the heavenly people I meet, or the gorgeous children and their warm and hilarious comments, which make me happy and cheerful wherever I go. This may make the people I meet feel I am ungrateful. Not at all! Just overtaken by life. I’m so sorry. To make up for it, and to say a sort of global shout of thanks to everyone, I’ve decided to make this entry a gallery, rather than a rant or a tedious list of the things I’ve been up to recently. Me at home (above) in mid-2015, taken for the 50th anniversary celebrations in 2016 of ‘my’ university: Flinders University, in Adelaide. Photo by James Little. Sydney, early January 2017. Me with Julie Vivas, illustrator of Possum Magic, and Wilfrid Gordon McDonald Partridge. On this day our two young grandsons met for the first time and had a great time playing together, as both of them are, surprise, surprise, imaginative. Julie provided a feast of a lunch. We rarely see each other because we live in different states, so this was a special occasion for all of us. 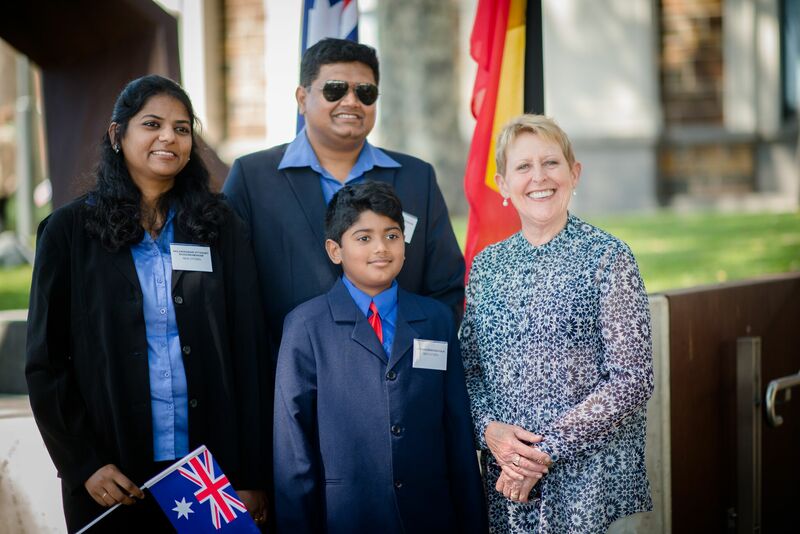 This gorgeous photo was taken on Australia Day (Jan 26th, 2016) at a citizenship ceremony in Norwood, South Australia. I had this family’s names but have lost them in the time it’s taken for me to post the photo. If it’s you, let me know! On this day and on this occasion I read I’m Australian Too in public for the first time, in advance of its publication on March 1st. 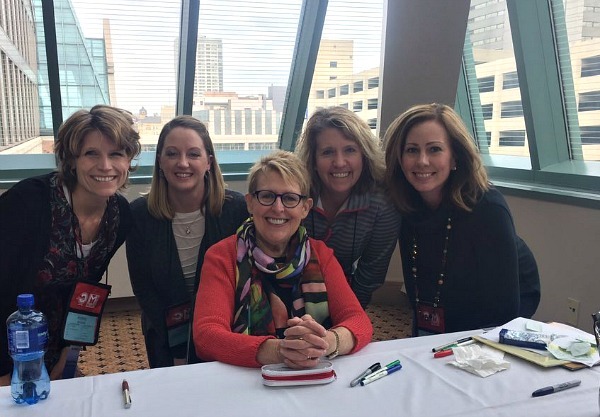 Me in the middle, (above) with four lively teachers at a book signing in Milwaukee, at the Wisconsin State Reading Association convention, February 2017. This was the brilliant conference I went to when I had the hideous experience of being aggressively questioned at LA airport. 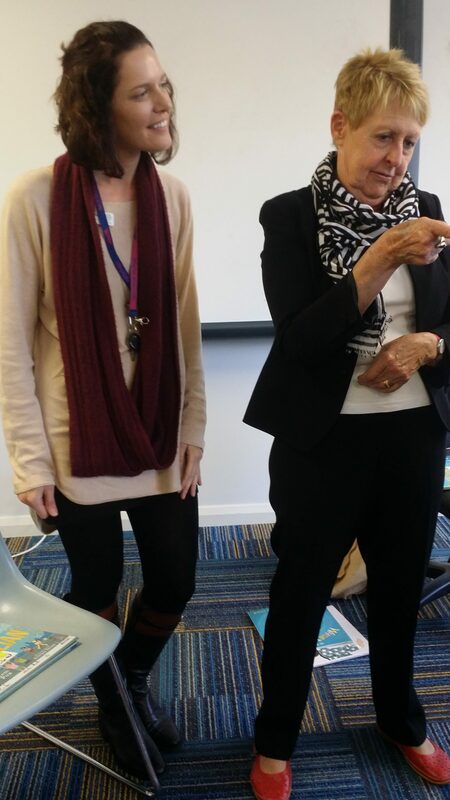 The theme of the literacy conference was, ironically, inclusivity and multi-culturalism. Hah. I wrote down the names of these teachers at the time, and then lost the slip of paper I’d written them on. If it’s you, let me know! Mega-thanks to Deborah Cromer, who invited me, and cared for me royally. 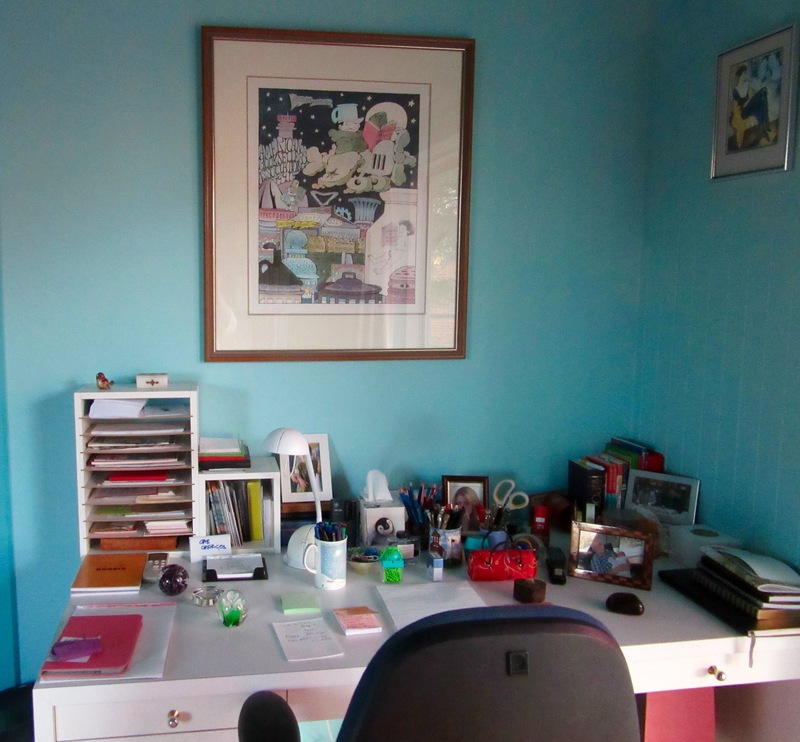 I have two desks: one in my office for typing and office work, obviously; and one in the bedroom for handwriting. This is the handwriting desk. Most of my early drafts, and all my letters and cards are written at this desk, either in 4B pencil for the drafts—or, for letters—a fountain pen, with real ink. This is a bit fuzzy but it’s too precious not to include in this gallery. 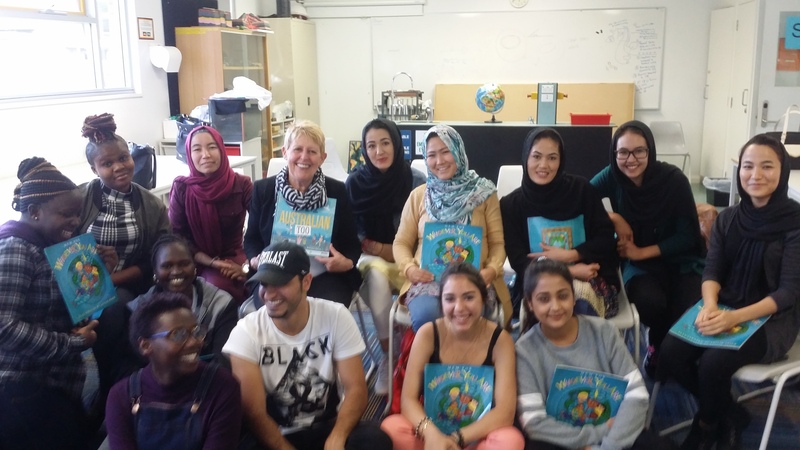 It’s a photo of Haidee Baker’s class at Thebarton Senior College, in Adelaide, in March 2017. 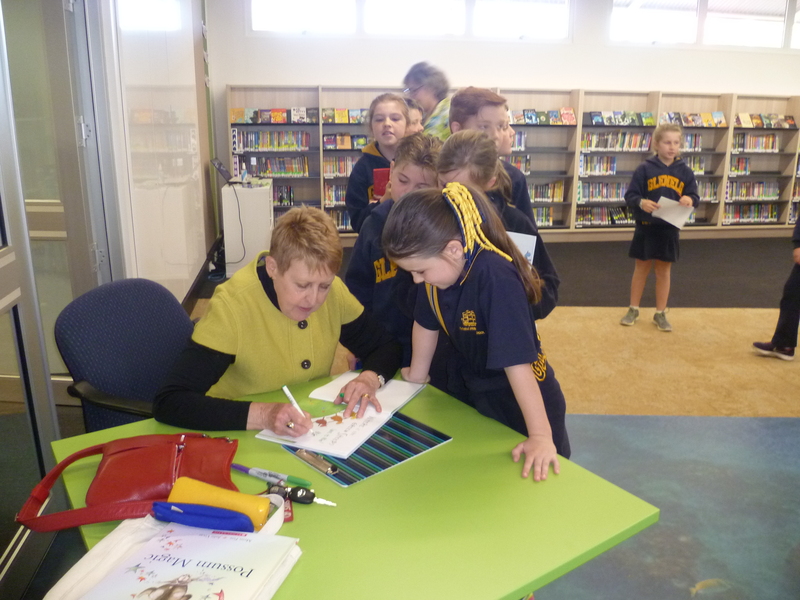 As you can see, I had given each student a copy of Whoever You Are, a book straight from my heart to theirs. 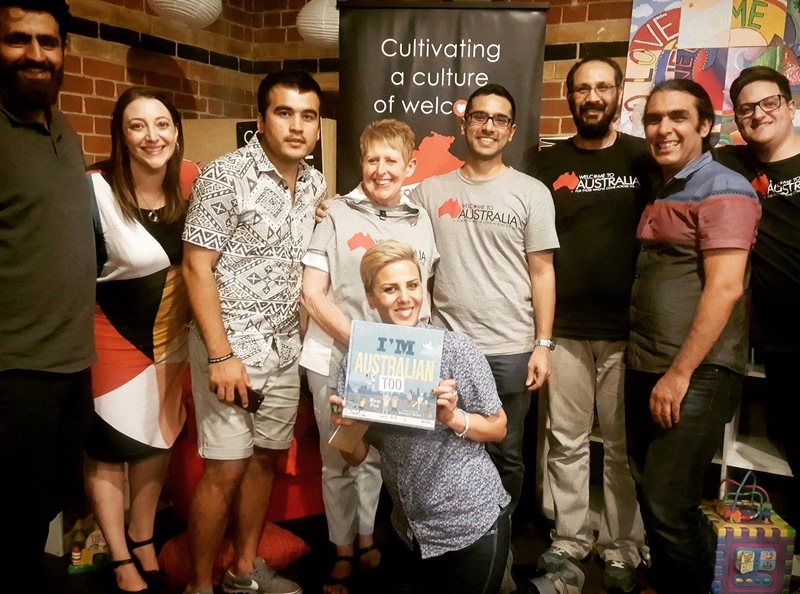 When I read them I’m Australian Too, I barely got through it, because in front of me were refugees in Australia, learning English, and hoping to be be welcomed and allowed to stay—the very people for whom I had written the book, listening to me tell a story about them. It was unsettling and heart-breaking. Haidee, below, wept openly. 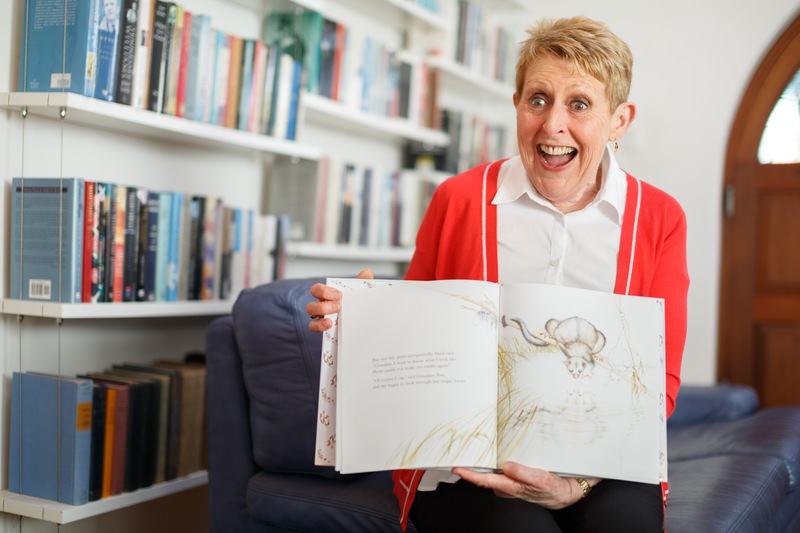 Me (above) reading Possum Magic for the millionth time (and still with pleasure!) at Thomas Hassall Anglican College in Sydney, April 2017. Thank you, Jo Hutchens ! This photo was taken in June 2017 at Seaview Downs Primary School in Adelaide. 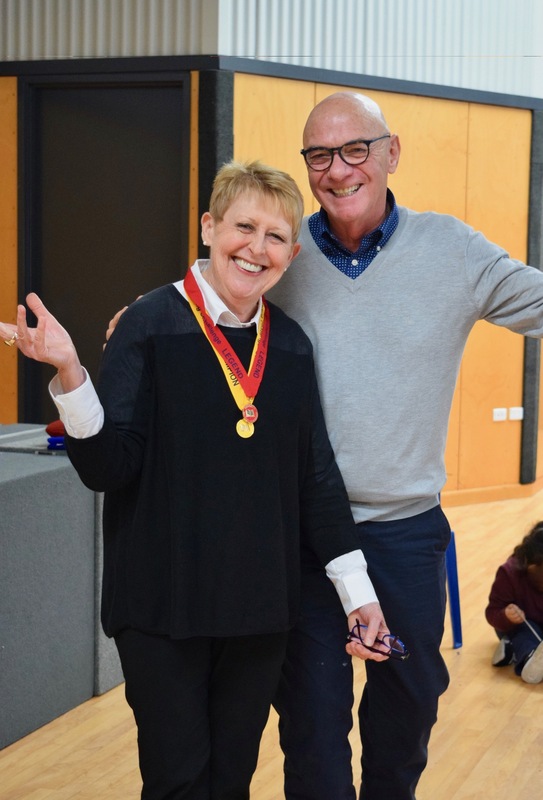 Des Hurst is the principal, but more importantly to me, he’s an adored ex-student from many years ago. 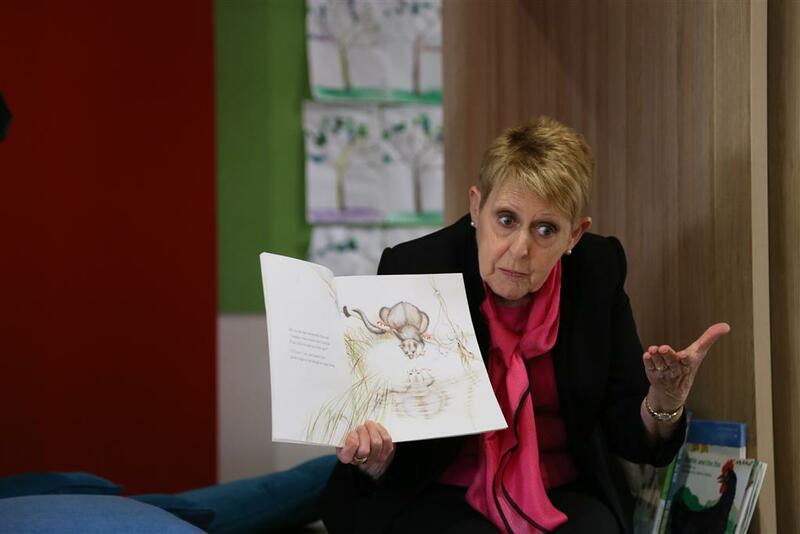 The occasion was under the auspices of the South Australian Premier’s Reading Challenge, for whom I am an ambassador. I’m wearing two of the medals as a joke: Champion, and Legend, because I’ve read so many books in my life. 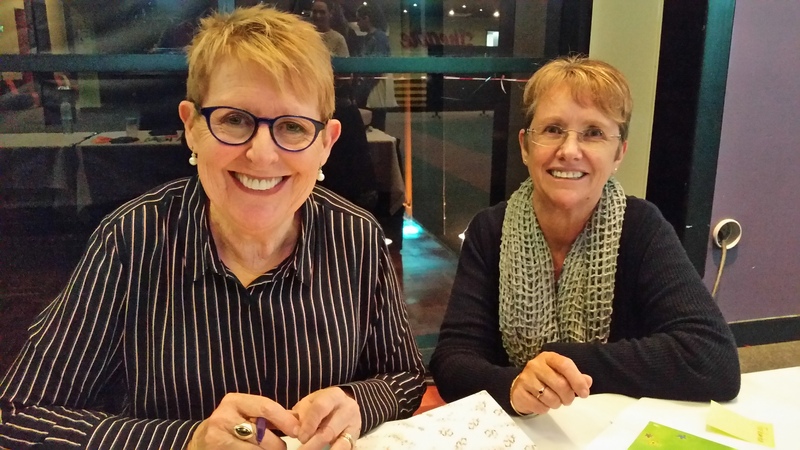 At the Mary Poppins Festival in Maryborough, Queensland, June 2017 with Trish (above) the librarian at Torbanlea State School in Maryborough. I spoke 7 times in two days and didn’t lose my voice, but the books signings punished my wrist. I had to remember that a painful arm and wrist were signs of having many happy readers, and an inner voice told me: ‘You should be so lucky. Never complain!’…. 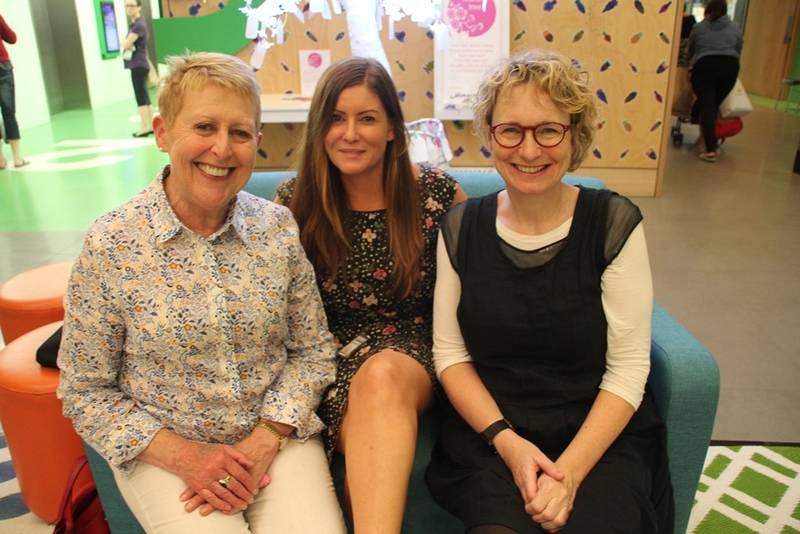 On June 29th I spoke to 200 adults, and a hilarious time was had by all. Such divine people. 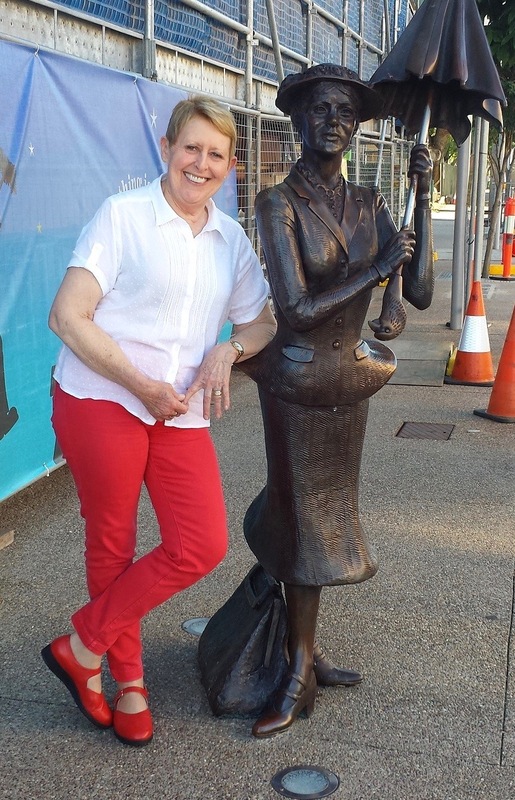 PL Travers, the author of Mary Poppins and many other books, was born in Maryborough, hence the festival. This is me, below, leaning on the Mary Poppins statue. In the background is the bank that PL Travers was born in—sadly, being renovated while I was there. I look tired because frankly, I was. Tired but happy, as they say. (Below) Can you see me? 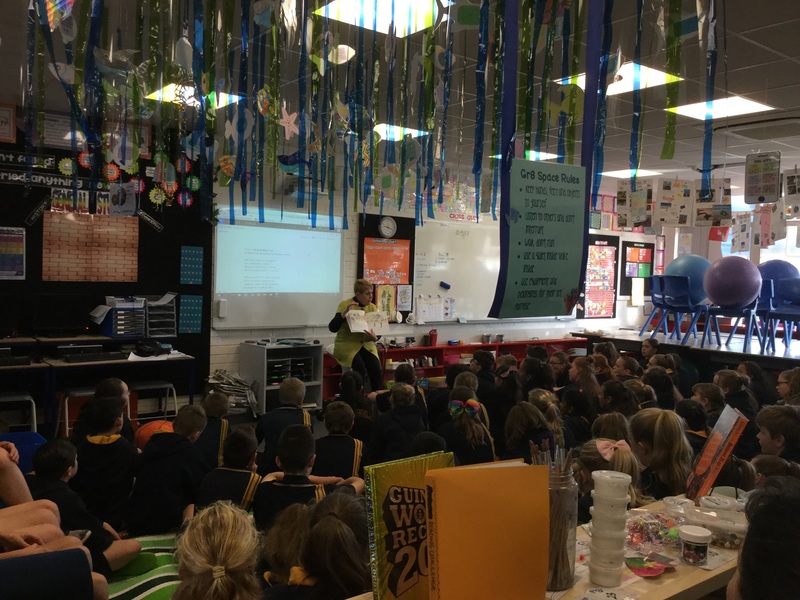 I’m at Glenelg Primary School, very near where I live, telling the older students why they shouldn’t use adjectives and adverbs. 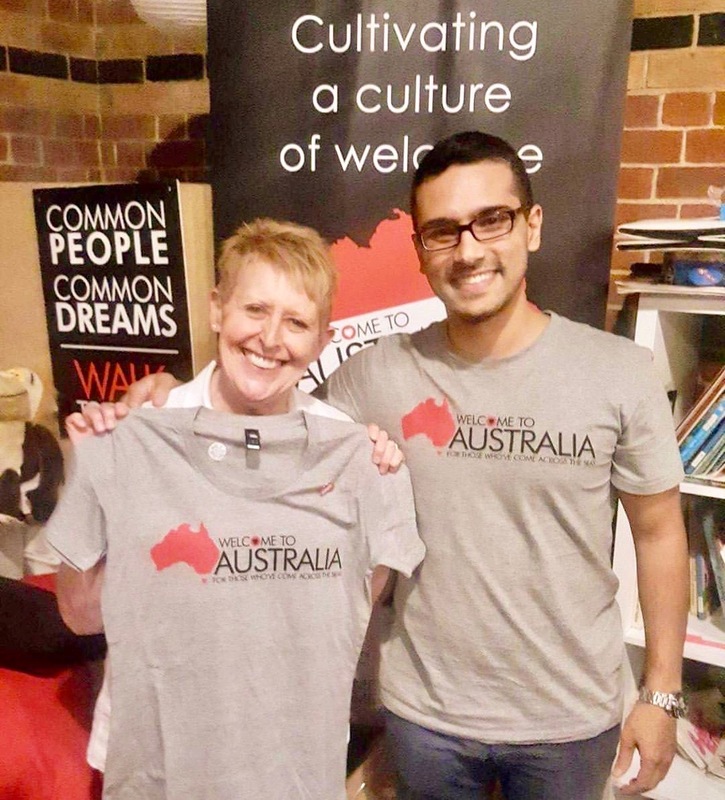 Wayne Swan, with me (below), is a federal Labor Member of Parliament in Australia. He was once voted the world’s best treasurer. Because of his policies, and those of the government of the day, Australia was one of only two countries that came through unscathed from the the global financial crisis of 2007-209. I am therefore a great admirer. 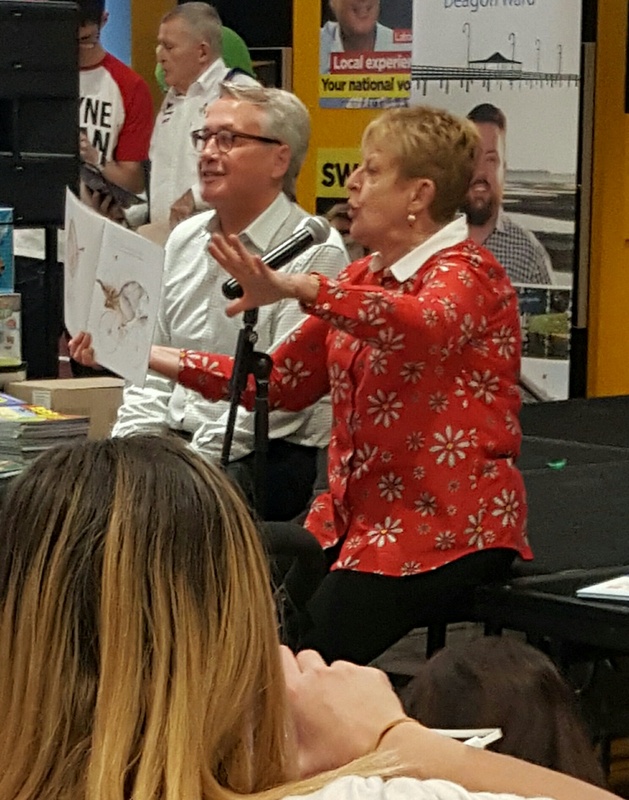 In this picture I am helping him at a Welcoming the Babies event, at Taigum Shopping Centre in Brisbane in July 2017. I detest winter! This late-autumn photo was taken by my husband. 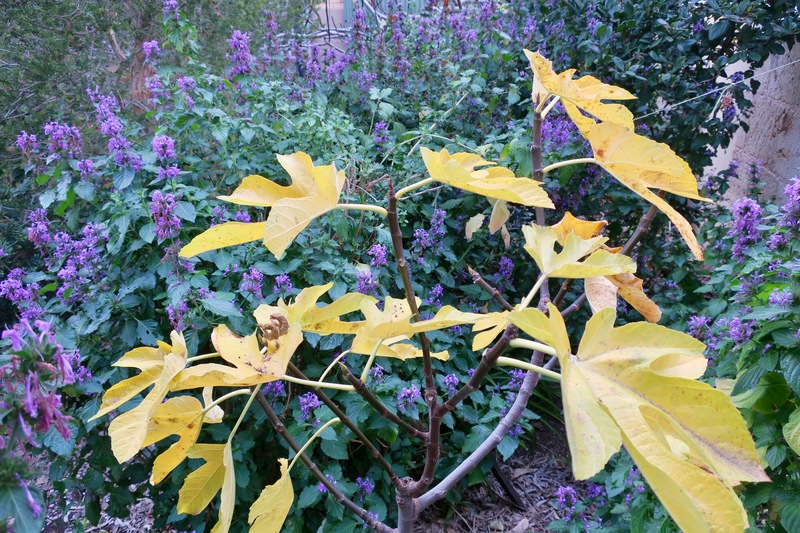 He planted the little fig tree whose leaves were going yellow, with reluctance. They hate winter too. Happy days, till next time! 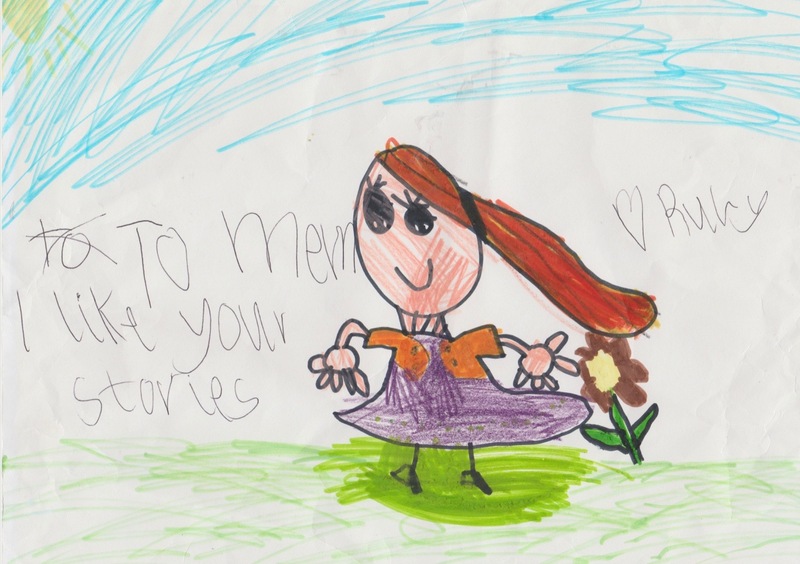 And thanks for the picture below, Ruby. It’s so like me. That’s it, friends! I hope to be a better correspondent in future, but I’m afraid I’ve said that many times before, to little effect.